Hello All, Happy New Year! A little late!! It’s been so long since I have been here, but I have been thinking about all the nice people here, and have been so eager to come and say hello, and wish you a Happy New Year and all of that. Throughout the season I had the most beautiful Amaryllis that I photographed obsessively! I couldn’t believe how it grew almost in front of my eyes. I would walk away and come back and it would be bigger, the bud opened more and more, and the flowers grander and grander. I NEVER experienced anything as spectacular as this (reminded me of my Spider plant this summer!) — and of course it made me think of GOY. I couldn’t wait to post the pictures. It was really a very fascinating experience for me. I never owned one before. One morning I watched the wonderful Ingmar Bergman movie, Fanny and Alexander, which was set in Sweden in the Early twentieth Century, and during a beautiful Christmas scene, the house was filled with plants and candles & food and people, and also a Christmas Tree hung upside down from the ceiling I think, as well as the colorful Amaryllis! 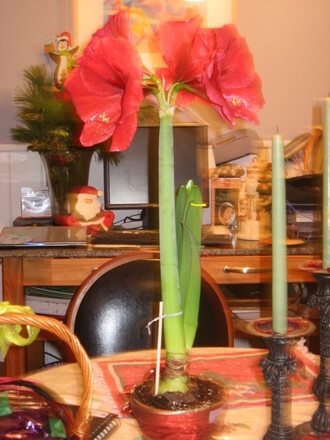 Here’s a picture of my Amaryllis, a little fuzzy but you get the idea! I was in love …lol..or was it obsession???!!! This Christmas we had a last minute snowstorm so I was unable to do much decorating outside but I was able to get some nice greens from the local organic food market -holly and such - which looked lovely on the table. 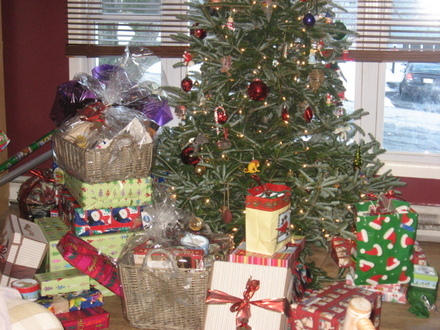 ..and although I was a little late getting everything ready, Santa arrived right on time to bring everyone their gifts, and we had a jolly time. I had a 50th birthday in between all of the hoopla, and I missed my Dad tremendously this year, as he passed on in August, but I do feel him with me, and at least he wasn’t here sick. Which would’ve been just awful. But I really love the Christmas tree and decorations, and frankly some of it is still around, lingering, until valentine’s day is my guess! I’m a later bloomer, so to speak! But all throughout I must say I thought of all the nice people here, and I was so busy trying to get everyone settled, and so busy being a MOM, and taking care of my mom, etc, that I didn’t have too much of a chance to stop by and say hello. I did get to peak in a few times, and you all seemed busy and joyful! It sounds like you ALL had a wonderful time, and here’s to a lovely 2009. May we all be blessed with good health, great fun, and beautiful plants! Next post: Poem:7am, first day of spring. 2009. Glad to hear you had a good holiday season Poetgardener. It sounds like you were very busy. Happy New Year to you and happy gardening in 2009. Lovely reading, great pictures Poetgardener. I detect some snow there outside looking through your window. 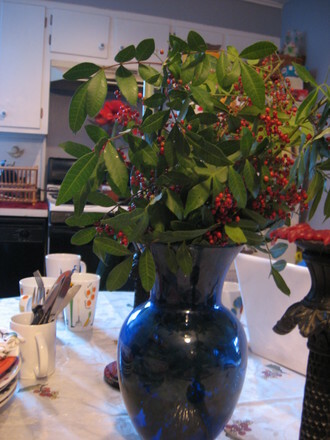 The blue vase with holly and such looks very grand, but of course the Amarillis must be your proud and joy. I remember my mother in law, years ago in Holland so proud of her Amarillisses, which grew in her window sill. That was the first time I ever saw one. They really make a statement, don't they? Is it still flowering? Hi there, nice to hear from you. I understand all too well about losing a parent, as I lost my very special mum in September. I love Amaryllus 'plants' too - I have two just coming up - fast - and several more from last year that I hope will flower again. Thank you for your greetings and I send some back to you! I've got one that someone got me for xmas which is coming on really well, sorry for the loss of your dad, i lost my mum 25yrs at the end of Feband my dad nearly 24yrs ago although its along time ago,it does get easyier, but i still miss them very very much, anyway all the best for 2009. I lost my Father 9 yrs tomorrow .I still expect to see him through the window coming to visit . Well, you all are making me cry but only in the best of ways. I think I must write a book about losing a parent, because although I'm sure there must be one out there, I just never expected it to be so hard and people just don't really talk about it. So thank you all for being so caring and kind, and I am sorry for all your losses, as well. It is of course, the circle of life, but that doesn't always make it easier. My Dad was just as obsessive as I am about beautiful things, though, and a Sagitarius like me. So I know where I get it from. Hi , I'm glad you had a nice Christmas. Thank Hywel, I must say my mum is a real treat! she's quite a piece of work, that one is. There is not a day goes by that we don't laugh. The hardest part is that she's getting on in this new life, but she doesn't hear so well and will NOT get a hearing aid. I decided that Older people (over 80!) are like old dogs...in a good way...nice and mellow and just happy to have a nice place to take a nap, with some good company now and again, and a good warm supper that's not too difficult to chew! Oh, and the Amiryllus (whose spelling illudes me..) is still growing even without the flowers...now just the greens are growing taller and taller every day! wow..nature! oh, to be a plant! Nature! The Weather in NJ. Some like it hot. Poem:7am, first day of spring. 2009.